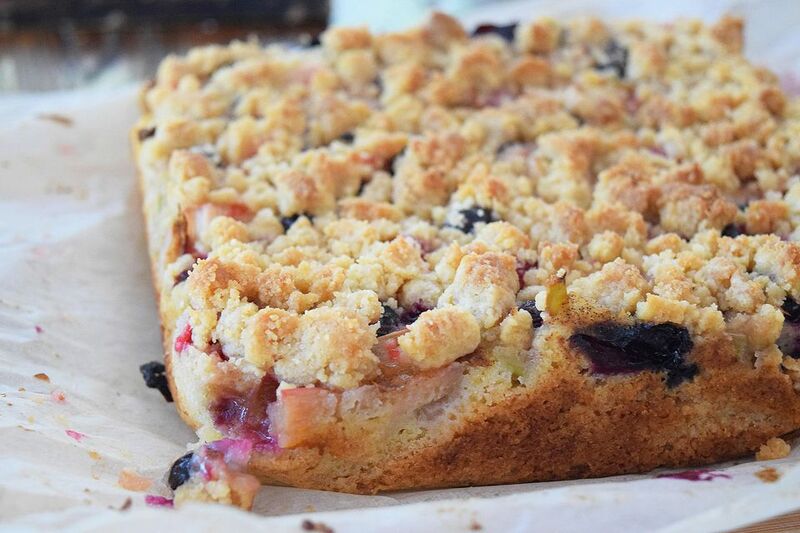 These delicious berry crumb bars are a tasty addition to any brunch or tea! Serve with sangria, pancakes, or cinnamon rolls! They are super easy to make ahead of time and store well for a few days! Bumbleberry is a term my family discovered while vacationing in Canada! It just means a bunch of different berries all mixed together (and it sounds cuter than mixed berry). It can also mean adding rhubarb or peaches! Any combination of summer fruits work really well together! In this recipe I used blackberries, blueberries, raspberries, and rhubarb. However, strawberries or any other berry work perfectly well! You can use frozen, but make sure to thaw and drain them before using in this recipe. This recipe makes extra streusel topping. You may add as much or as little streusel as you like! Make sure to line the pan with parchment paper to make sure nothing sticks! If you don't have parchment paper you can generously grease and then lightly flour the pan. Add the lemon juice and sugar to the fruit. Stir to combine and let sit for at least 10 minutes. Cream together 2/3 cup of softened butter with 3/4 cup of sugar. Then add in 1/2 teaspoon of grated lemon or orange peel, 1/2 teaspoon vanilla, and 1 egg, beat until fluffy. Then stir in 4 teaspoons of milk. Add in 2 cups of flour, 1 1/2 teaspoons of baking powder and 1/4 teaspoon of salt. Line a 9x9 baking pan with parchment paper and spread the cookie mixture evenly in the pan. Bake for about 10 minutes, just to set the base. Whisk the salt and brown sugar with the melted butter. Use a fork to stir in the flour until it forms large crumbs. Strain the fruit mixture and add it on top of the cookie base evenly. Top with 1/2 to 3/4 of the streusel topping and bake for about 40 minutes until the crumb topping is browned and the fruit is softened.